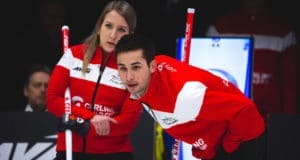 The young Canadian mixed doubles tandem of Kadriana Sahaidak and Colton Lott came out firing against Jenny Perret and Martin Rios (2018 world champs, Olympic silver-medallists) and earned an 8-7 win to kick off the third leg of the Curling World Cup in Jököping, Sweden, on Wednesday. 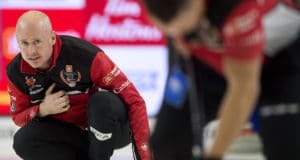 Teams representing Canada in men’s, women’s and mixed doubles competition will open play Wednesday in the third leg of the Curling World Cup inn Jököping, Sweden. ESTEVAN, Sask. 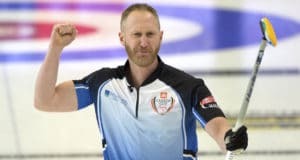 – Brad Jacobs has an impressive resume – Olympic gold medal, Tim Hortons Brier gold medal, men’s world championship silver medal – and now he can add the Home Hardware Canada Cup. The Sault Ste. Marie, Ont., skip and his mate shepherded a deuce in the first end all the way through to the 10th end for a tightly contested 5-4 win over Kevin Koe of Calgary. ESTEVAN, Sask. – Jennifer Jones showed once again on Sunday why she’s been one of the premiere female curlers in the world for years. 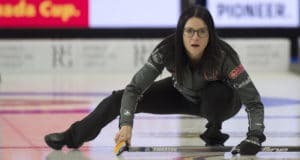 The 44-year-old Winnipeg skip calmly executed a long runback double takeout to score three in the ninth end to beat Kerri Einarson’s Gimli, Man., team 8-5 to win her record fourth women’s title at the 2018 Home Hardware Canada Cup. ESTEVAN, Sask. – Veteran Jennifer Jones rode a three-ender in the fourth to an 8-4 victory over Rachel Homan of Ottawa in the women’s semifinal at the Home Hardware Canada Cup on Saturday evening at Affinity Place. ESTEVAN, Sask. – It will be Kevin Koe of Calgary versus Brad Jacobs of Sault Ste. 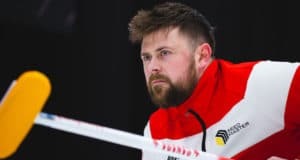 Marie, Ont., in Sunday’s men’s final at the 2018 Home Hardware Canada Cup after Koe rallied for a 7-5 win over Brad Gushue of St. John’s, N.L., in Saturday’s semifinal. ESTEVAN, Sask. — It has been a magical and, yes, surprising start to the 2018-19 curling season for Kerri Einarson’s new team. ESTEVAN, Sask. – Brad Gushue is in while Kevin Koe and Brendan Bottcher will play a tiebreaker Saturday morning to determine the last playoff team after the final round-robin men’s draw at the Home Hardware Canada Cup at Affinity Place in Estevan, Sask. ESTEVAN, Sask. – In the end it was typical Brad Jacobs: make the big shot on final stone for a come-from-behind victory. And in this case one that clinched first place in the round-robin and moved his Sault Ste. Marie, Ont., team right into Sunday’s final of the 2018 Home Hardware Canada Cup. ESTEVAN, Sask. — On the surface, it was another round-robin game at the 2018 Home Hardware Canada Cup between two of the top men’s teams in Canada. ESTEVAN, Sask. – Jennifer Jones and Rachel Homan have had some epic battles since Homan’s Ottawa-based team emerged as heir apparent to the powerful Winnipeg crew. Thursday night at the Home Hardware Canada Cup was not one of those. ESTEVAN, Sask. — Thursday was not a great day for John Epping and his Toronto teammates at the 2018 Home Hardware Canada Cup. The foursome went into the day tied for top spot at 2-0 but emerged severely bruised at 2-2.